Nokia N97 is the tip of the spear in Nokia's smartphone lineup. It is the most powerful, smartest and fully featured phone of the company. It is also the first Nokia phone to make use of a large touch-display and that alone has raised the expectations from die hard Nokia fans that have refused to switch over to the iPhone. And Nokia has put quite a lot of work and thought in the N97. I had a first look when Nokia was still developing the N97 and I was looking forward to get my hands on the final product. In this review, I will tell you how I used it, and how well it did. Does the Nokia N97 live up to the hype? Nokia N97 mainly as a smartphone with Exchange support. Web browsing was tested regularly to read news and check various sites. Facebook was accessed via the Facebook application included in the phone. Nokia N900, As with any phone, the first thing is how good the sound quality is, and how easy it is to dial a number or a contact. The good news is that the sound quality is good, although the volume is not very loud. It would be nice to have a more powerful sound output. Dialing a number is quick and relatively efficient. There's no need to use the physical keyboard as the virtual numeric pad works great and there was no typo whatsoever while dialing numbers. in Nokia N900, Dialing a contact is a bit more complex, if you have a bunch of them. From the contact list, you can scroll and click, or type a name and click. Typing a name requires the use of the physical keyboard, which is not very practical if you phone was closed. The T-Mobile G1 suffered from the same lack of virtual keyboard. Every qwerty slider phone should have one. As you try to dial, the phone will ask you if you want to place a video call, each time! I've not seen anyone use video calls (ever), so I think that Nokia should have the option to skip that question. After a week, it was getting on my nerves. Answering calls is easy, so is placing people on hold, or hang up. Good job Nokia. Locking and unlocking the phone is also easy and foolproof, thanks to the side button. Nokia N97 is a nicely designed phone. The design is agreeable to look at, and the build quality is good, except for the battery cover which has a plastic feel - but it needs to be flexible because it's *removable*. The display is a mixed bag: it has a resolution of 640x360 but the colors seem a little faded and the clarity seems inferior to other touch phones. I suspect that one of the display layers has something to do with this. Two people that I've shown the phone to immediately made the same remark as well. Next to the speaker, you will notice a front-facing camera and a proximity sensor. The 5 Megapixel camera is in the back, protected by a sliding lens cover. There's a "camera" button that makes taking picture more natural than taping on the screen (which often induces a last minute shake that could makes photos blurry). The keyboard sliding mechanism feels solid. Nokia N97 is a little thick (15.9mm). The bottom part is basically as thick as Blackberry curve or an iPhone, and the display is 3mm (or so) thick on top of it. These 3mm represent what it takes to add a physical keyboard to a phone like that. The T-Mobile G1 is even thicker at 16.35mm. If you want a big display and a full keyboard that's the price to pay right now. Nokia N97 use a standard micro-B USB connector and a standard voltage, which makes it compatible with BlackBerry chargers or any USB micro-B cable. 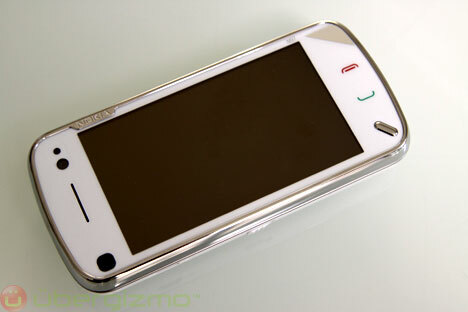 Nokia N97 can be used as a pure touch phone. Nokia has done an "ok job" on the tactile user interface. It's mostly intuitive, except for the setup menus. Nokia N97 uses a double-tap system to avoid accidental clicks vs. drag interpretations. For example, in the menu, if you want to go to my contacts, you need to click once to select "contacts", then click a second time to actually launch the application. Depending on your tastes this can be great or annoying. Nokia N97 portrait/landscape switch, works most of the time, but it sometimes won't switch from portrait to landscape and you will have to open the keyboard to force it to do so. Nokia N97's display, provides a tactile feedback upon clicking. It's interesting, but it won't help with typing speed, if you wonder. It might be something that you want to disable to expand the battery life a bit. Some functions like "Unlock" or "Menu" are accessible only by the hardware buttons, which is weird, considering that most people would expect everything to be accessible via the touch display. It's not a roadblock, but it's not completely intuitive. Nokia N97 is a mixed bag when it comes to responsiveness. It is responsive and does what you want, but if there are a few applications running it will get slow. Secondly, it's too much work to go and close them one by one, so I suspect that most people will do exactly what I did: nothing. All phones should have a "close all apps" icon on the homepage. Nokia N97 has the best homepage widgets implementation. On many phones, widgets are messy (like the OMNIA), but Nokia has done a good job at maximizing the use of screen space. The default homepage includes Facebook. Nokia N97 keyboard suffers from the same issue than all sliders have: the buttons are very thin, which reduces the typing speed - at least, for me. To be fair, this is one of the better slider keyboard that I have played with recently. Also, the keys are spaced just a little too far apart, making the finger travel much and that makes the typing slower too. The space key is oddly placed too. As an alternative, I would propose having an Sym, Shift and Func (to get the blue characters) on both side of the keyboard and place a recessed trackball, instead of using directional "joystick". Nokia N97 has a lot of email options and the one that I prefer for work is Exchange: it is well implemented and works flawlessly. Emails arrive instantly and the only thing that I noticed is that upon a soft reset (battery removal), the phone does not cache the Exchange email and spends time doing a "sync" from scratch (that can take a couple of minutes). Nokia N97 comes loaded with Nokia Maps, and I can say that it is my best "out of the box" experience with a default navigation app. Unlike Google maps, the Nokia maps are cached on the device itself, so once they are onboard, they are not downloaded (over the air) again. Better yet: you can pre-load an entire city, country or the whole world (4GB) so that Nokia maps doesn't load the maps while you're traveling. That cuts down on roaming charges, waiting time and frustration. Nokia Maps is fast and lets you scroll the map smoothly. Upon a zoom in/out it will take a second readjust the level of details (see video). I found the compass be not very useful in pedestrian mode. Using it makes the map rotate left and right -all the time- which doesn't help the overall map readability. Nokia should also improve the search and use a single text field like Google Maps does. It is also not possible to select an origin/destination directly on the map. That would be easy to add. Nokia Maps can send .lmx files that contains a geo-position, but unfortunately, there are no popular applications out there that read them, so you're stuck with sending it to your Nokia-wielding friends. Overall, Nokia Maps is a great mapping software and one of Nokia's finest application. I only wish that Nokia would make it available to other platforms like Google does. The Nokia N97 has a good browser, it worked with pretty much all the sites that went to, including Yahoo Finance and Google Docs. Y! Finance is usually an interesting site to try on a phone because it's hard to render on small displays. The N97's resolution is high enough to display it correctly, so that's a win. It is possible to log into Google Docs and view text documents, but sheets did not work, even in read-only mode. Adobe Flash Lite is supported. You can go on YouTube, follow links to YouTube and do things that you would normally do on a computer, without going through a YouTube "app". Ovi Store is a very basic implementation of an app store. The bottom-line is that there's nothing very exciting about it and most of the coolest application are already embedded in the N97 (my own preferences here, obviously). Browsing the store is a bit tedious and slow, I guess that I would rather browse apps on a PC and download something from there. "Existence" is often superior to "perfection", but I hope that Nokia will improve the store soon. Note that it is technically possible to use the Nokia N97 as a 3.5G modem. It works only via Bluetooth, which tends to deplete the battery faster. I think that a USB tethering option would come in handy in the future. The modem drivers are in the Nokia PC Suite or can be downloaded separately if you don't want to install all the software package. It won't come as a surprise that Nokia has a good 5 Megapixel camera. Of course, Megapixels don't mean much in terms of quality, but in my experience this is "good" to "very good". The flash works well too. In my tests, I found that the N97 had a photo quality superior to the Blackberry 8900 that we usually use to live blog. To see more photos, including full-size ones, head to our Flickr page. I had some issues with the video recording: the auto-focus never worked (!). Nobody else seems to complain, and Nokia has not replied to my email on the subject. At the moment, I'll file this as a "problem with our unit", but drop a comment if you noticed this elsewhere. With 32GB of internal memory and the possibility of adding 16GB more via a microSD card the storage is great. With Windows Media Player (iTunes is not supported), it is relatively easy to sync files with the N97 (who uses WMP to manage media files?). Make sure that you connect with the "Media Transfer" option and the N97 will appear in Windows Media Player. From there you can drag and drop things that you want to sync. It takes seconds to sync a dozen .mp3 files. WMA files with DRM won't work (Rhapsody...). As you can guess, the sound quality was definitely OK and will be limited by your earplugs, unless you are walking around with expensive audio gears. You can play music while reading your emails if you want. If a call occurs during the playback, the music will stop and will restart where it stopped. During the test, I found the that average battery life was about 1.5 to 2 days with my usage (see "context" up there). Obviously, this will vary a lot depending on your own usage, but the bottom line is that most people would charge it daily, but if you forget it, you won't have a dead phone in the morning. Nokia is playing catch up in a market that has become extremely competitive in the past couple of years. In that game and at that price, there's only one thing that really counts: the user experience. The Nokia N97 is not a "bad" phone and it doesn't deserve the some of the harsh reviews that I've seen recently. In fact, it has good hardware, great storage, and nice design. It is also better than the Sony Ericsson Xperia. The pricing however, is way too steep ($599 unlocked). Nokia fans who were anxiously waiting for the N97 will probably forgive its shortcomings, but I'm personally having a hard time to be really excited as there are excellent alternatives out there (at attractive prices). If you are already in love with the N97, I bet that you won't change your mind in light of this review and that’s OK. For those who are on the fence, I guess that you will stay on the other side.